Church isn’t just something you go to, and it’s much more than just a building. In Paul’s letter to Timothy, (1 Timothy 3:15) he wrote, “God’s family is the church.” And that means us. We’re the church. And we’re the family of God – every day. Our faith family in Upper Manhattan, known as Everyday Church, is in fact, a family where you can be known and where you know that you belong. Our gatherings are like a FAMILY REUNION: a celebration where relatives can catch up, share meals and memories, have fun and reflect together on life and God’s story. That’s what our next teaching series is all about. 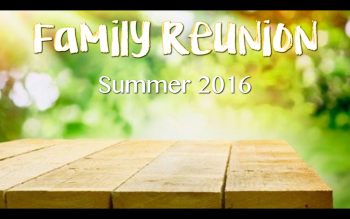 You don’t want to miss this chance to get to know your family, and to know the riches that we share as God’s family.